William Blake had thought that Satan was the hero of Milton’s Paradise Lost and that Milton "was of the Devil’s party." 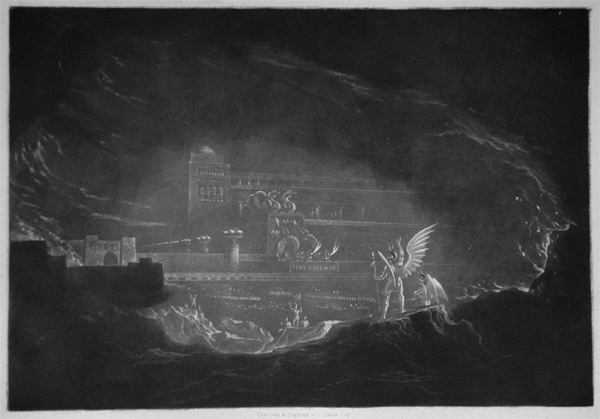 John Martin, writing after the French Revolution had given birth to both a Terror and an Empire, and after Napoleon's defeat at the Battle of Waterloo, has no such illusions: his mezzotints for an edition of Paradise Lost depict a war between light and darkness, and leave us always with the memory of the light shining in the darkness that cannot extinguish it. Martin's mezzotints on Paradise Lost and on The Last Judgment are justifiably famous as monuments to the visionary strain of Romantic art, conveying an impression not unlike that described in Mary Shelley's Frankensteinwritten just a few years before Martin's mezzotints were madein which Victor Frankenstein takes comfort in the landscape of the Alps the moment before his creature comes bounding to confront him: "The immense mountains and precipices that overhang me on every side, the sound of the river raging among the rocks, and the dashing of waterfalls around spoke of a power mighty as Omnipotenceand I ceased to fear or to bend before any being less almighty than that which had created and ruled the elements, here displayed in their most terrific guise." 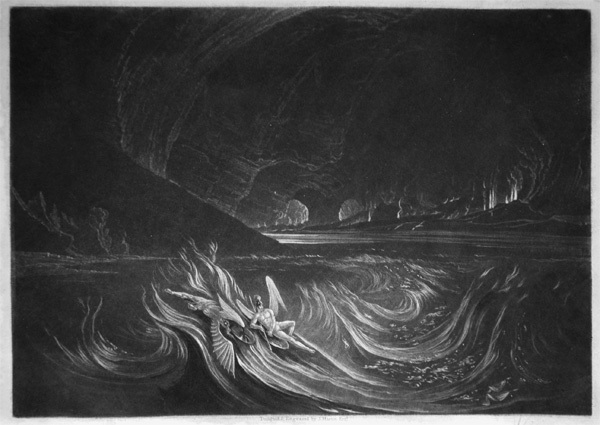 John Martin began the process of illustrating Milton's Paradise Lost in 1824 under commission from the publisher Septimus Prowett. The project called for the production of 48 mezzotints, 24 for an octavo size set and an equal number for a larger deluxe set. Prowett sold subscriptions to the sets, and subscribers received prints in increments until 1827, when the project was complete. In 1832 Prowett, an American who had not been able to persuade the English market for whom it had been intended to purchase it, sold Martin's plates to the publisher Charles Tilt, along with the substantial number of unsold sheets from his 1827 edition of Paradise Lost. Martin made revisions to a few of the plates, and the whole set was released in a bound edition. Attesting to their popularity, Martin's mezzotints were published in four additional editions after the Prowett plates were sold. The genius of Martin's composition, and his uncanny mastery of light, dark, mist and shadow in a medium as exacting as mezzotint, are as difficult to fathom now as they were in the 19th century. In April 1825 Martin exhibited 20 of his mezzotints at the Royal Society of British Artists, and the art public was enthusiastic in their reception. A contemporary critic wrote, "we know of no artist whose genius so perfectly fitted him to be the illustrator of the mighty Milton . . . and he has more than realized the highest of our hopes. There is a wildness, a grandeur and a mystery about his designs which are indescribably fine." Martin's mezzotints differed from most other prints of the period in their originality. The vast majority of prints then in circulation were reproductive engravings, reproducing in graphic version a well known or promoted painting. Few artists of the period did their own graphic work, content to leave the drudgery of scraping and incising difficult metals to engravers with the talent and patience for such work. 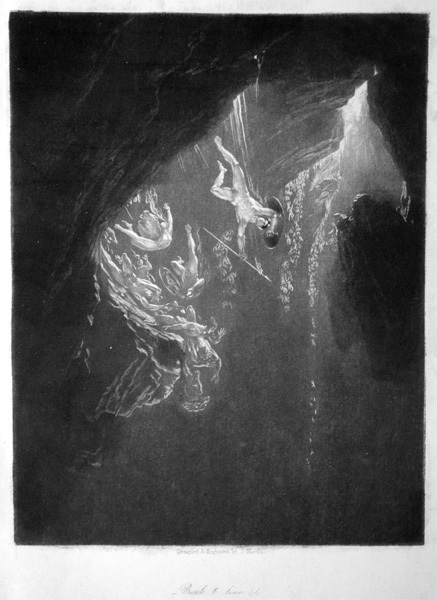 With one exception (a single design based on an earlier painting), Martin's work was completely original: he did the mezzotinting himself, he worked directly on the plate without making preliminary paintings, sketches or watercolors; and his visions of Heaven and Hell, of the conflict between Good and Evil, between the Heavenly Host and Satan are spectacularly original in their drama and scope, a summit of Romantic art. Martin executed two series of original mezzotints, a folio-size series (published 1827) and a smaller-size edition in Imperial Octavo (also published in 1827), which he worked on simultaneously, between 1823 and 1827. We have a number of impressions from one of the 50 sets containing mezzotints marked "PROOF" assembled for the first edition of the Imperial Octavo edition of John Milton's Paradise Lost; These will be illustrated n the first 4 Martin pages. We also have a complete set of the 24 plates prepared for and printed in the 1827 Prowett octavo edition and incorporated in Charles Tilt's 1833 edition. These will be illustrated in Martin pages 5 through 8. The authority on these images in Michael Campbell, whose catalogue raisonné is the essential reference and from which we have summarized the second and third paragraphs above (John Martin, Visionary Printmaker; York: Campbell Fine Art & York City Art Gallery, 1992). All titles are taken from the "List of the Engravings" in the 1833 edition. Selected Bibliography: Thomas Balston, John Martin 1789-1854 His Life and Works (London: Gerald Duckworth, 1947), Michael J. Campbell et al John Martin, Visionary Printmaker (York: Campbell Fine Art/York City Art Gallery, 1992), Christopher Johnstone, John Martin (London: Academy Editions 1974), Mary Pendered, John Martin, Painter: His Life And Times (London: Hurst and Blackett, 1923). The Fall of the Rebel Angels (C. W. 50). Original mezzotint with drypoint, 1824. Our impression is from the 1833 edition of John Milton's Paradise Lost published by Charles Tilt from Martin's original plates. Image size: 194x152mm. Price: $750. 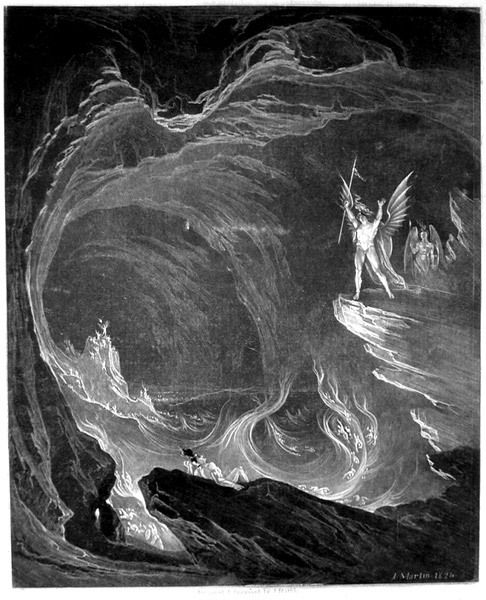 Satan on the burning lake (C. W. 51). Original mezzotint with drypoint, 1824-1825. Our impression is from the 1833 edition of John Milton's Paradise Lost published by Charles Tilt from Martin's original plates. Image size: 154x219mm. Price: $750. Satan arousing the fallen angels. (C. W. 52). 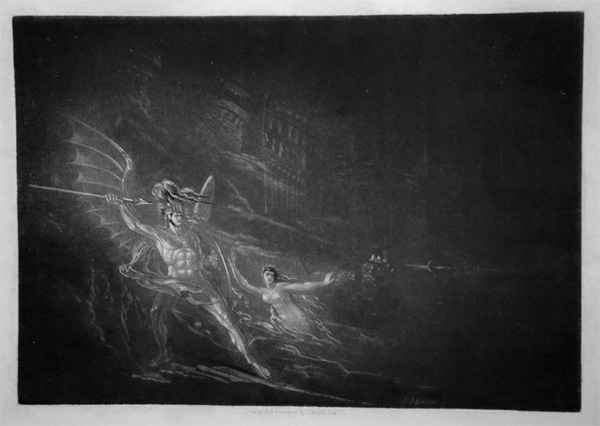 Original mezzotint with drypoint, 1824. Our impression is from the 1833 edition of John Milton's Paradise Lost published by Charles Tilt from Martin's original plates. Image size: 191x156mm. Price: $800. Pandemonium (C. W. 53). Original mezzotint with drypoint, 1824. Our impression is from the 1833 edition of John Milton's Paradise Lost published by Charles Tilt from the original plates. Image size: 194x152mm. Price: $750. Satan on his throne (C. W. 54). Original mezzotint with drypoint, 1824. Our impression is from the 1833 edition of John Milton's Paradise Lost published by Charles Tilt from Martin's original plates. Image size: 143x205mm. Price: $750. Sin preventing the combat between Satan and Death (C. W. 55). 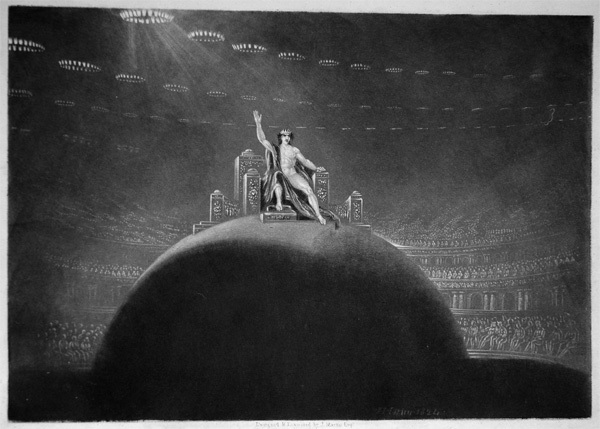 Original mezzotint with etching, 1824. Our impression is from the 1833 edition of John Milton's Paradise Lost published by Charles Tilt from Martin's original plates. Image size: 143x207mm. Price: $750.